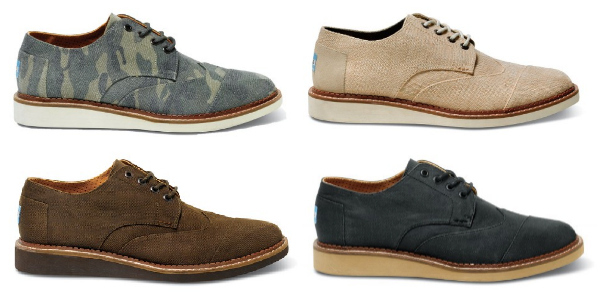 TOMS Shoes has been upping the ante of its men’s footwear collection lately. This past May we saw their first men’s only shoe, the Paseo, a personal summer favorite of mine that has gone on to include several new colors and patterns. Now the shoe company known for its charitable foundation is expanding into a timeless and sophisticated shoe design with the new Brogue. Taking the classic wingtip details its name implies, TOMS uses signature materials such of canvas, burlap and aviator twill to provide different options to the design—which includes a more dense rubber outsole for traction and breathable suede insoles. The camo patterned pair comes in canvas, the West Coast influence stands out with the beige burlap option, and the aviator twill shoes are available in chocolate, ash and a beautiful burgundy (above). 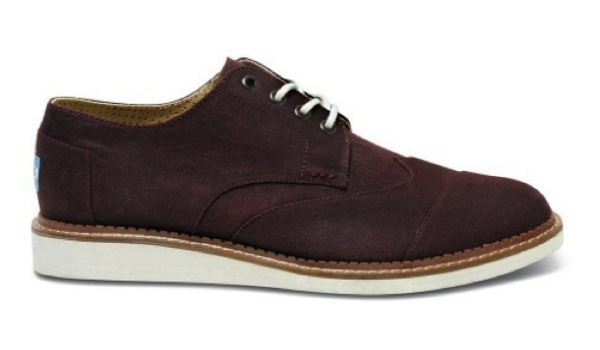 Each Brogue is available online for $98 each. Posted on July 25, 2013, in Fashion and tagged Fashion, Shoes, Toms. Bookmark the permalink. Leave a comment.